Marvin.ie is delighted to support Waterford Tech Meetup, hosted by Boxworks.Co.Work.Space. 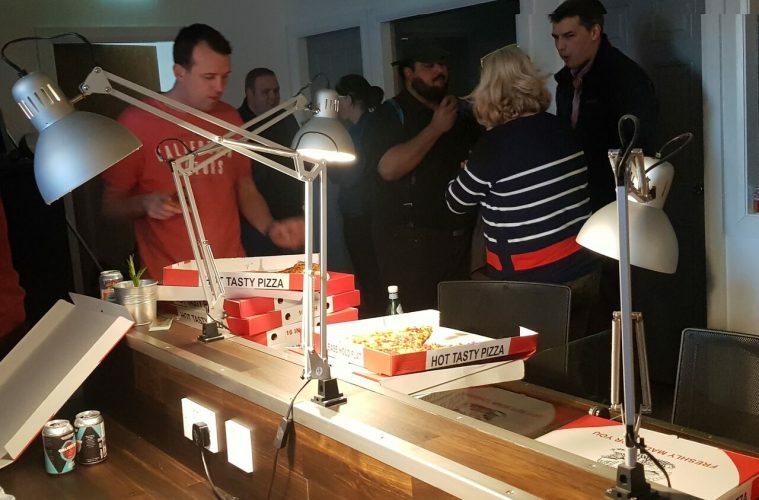 Tonight, over 80 hungry tech workers in Waterford City will be tucking into pizza provided by online takeaway ordering site, Marvin.ie; this is the second Waterford Tech Meetup Marvin has sponsored in as many months. “Boxworks is delighted to have Marvin on board as a sponsor for the Waterford Tech Meetup and we very much hope this will become an ongoing arrangement. Great to have Food delivered to our premises hot & on time,” said Boxworks director, Jim Gordon. Through co-operation with hundreds of takeaways across the country, including 35 restaurants in Waterford City, Marvin does online food online easily, faster and cheaper. “Networks and relationship building are at the heart of what Marvin.ie does; we work closely with our takeaway partners to ensure high standards of quality and service for customers. As Waterford’s leading co-working space, these are values that Boxworks shares, and we hope to be involved in many more events of this nature as we expand our network of restaurants in Waterford over the coming months,” says Marvin co-founder and managing director, James Galvin. Tech, entrepreneurship, enterprise and innovation are also at Marvin.ie’s core; Marvin is part of the Hungry Group, which is backed by Jesper Buch, one of the leading tech entrepreneurs in Europe. Ordering food through Marvin.ie or via the Marvin smartphone app is simple: orders are passed to the restaurant in real-time; customers then receive an SMS confirming the order and an accurate delivery time. Opt to pay by cash, card or ApplePay. Follow Marvin.ie on Twitter, @Marvin_ie; like Marvin on Facebook.